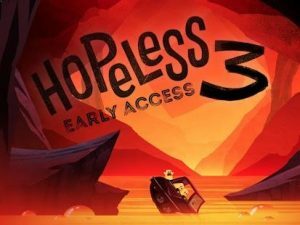 Hopeless 3 : The blobs are back with a vengeance! Join the ride in the 3rd chapter of the indie hit series, HOPELESS! Journey from the frigid poles to the center of the planet in an epic quest to rescue the remaining blobs. Unlock and collect an array of carts, cars, and tanks, and arm yourself with powerful guns to defeat the evil monsters! Experience the rich environment of the Hopeless world, from dark caves to icy planes. Upgrade your ride from one tiny cart with a pistol to a mighty war machine on wheels, ready to take on any challenge! OMG! Where to start?! This is a MAJOR update! Use any weapon at any world! Swap weapons while you ride! Stock up on ammo before venturing into the cave! Pump monsters full of lead with the classic Shotgun! Reworked all the levels. Added over 9000 buckets of fun! Amazing new graphics and effects! Translations to Japanese, Korean and Chinese! Now go kill some monsters!